Headwinds are hitting America's job market. The U.S. economy only added 142,000 jobs in September and the number of jobs created in July and August were revised down. Anything near or above 200,000 jobs is considered healthy and economists surveyed by CNNMoney predicted there would be 204,000 jobs gained in the month. "It's a very disappointing report across the board," says Sung Sohn, an economics professor at California State University, Channel Islands. "The U.S economy is really buckling under the pressure of a global economic slowdown." The unemployment rate stayed at 5.1%, its lowest level in 7 years. The weak September jobs report could be a sign that slowing global economic growth is beginning to hurt the U.S. job market. China's economy has slowed down considerably and that's putting pressure on lots of developing countries. Eventually, the slow global growth is expected to hurt U.S. trade and jobs. At least one large U.S. company -- Caterpillar -- cited the global slowdown for announcing 10,000 job cuts over the next few years. Uncertainty abroad can also cause employers in America to hesitate on new hires. "When there's uncertainty people just wait and see," says Joe Huddle, executive vice president at DHR International. Huddle cautions against reading into too much into one jobs report and argues that September could just be a "blip." There are other concerning signs. One reason for the lackluster job gains in September was that more people left the work force. The labor force participation rate -- a measure of how many people are working or looking for work -- declined to 62.4% from 62.6%. The Labor Department also revised down job gains in July by 22,000 and August by 37,000. In August, the economy only added 136,000 jobs down from the first estimate of 173,000. Wages still aren't budging either. Average hourly earnings only rose 2.2% in September. America's central bank, the Federal Reserve wants to see 3.5% wage growth. A lack of wage growth is a big reason why many Americans haven't felt the benefits of U.S. economy's recovery. By now we know the job market this year won't be the stud it was in 2014. Last year was America's best year of job gains since 1999. Between January and September last year the economy gained 238,000 jobs a month on average. This year, its 198,000. The jobs report also holds a lot of significance for the Fed, which is getting ready to raise its key interest rate for the first time in almost a decade. A Fed rate hike would be a good sign of the economy's health. However, the Fed's committee members want to see strong economic data before it raises rates. Friday's report is not an encouraging number for a rate hike at the end of October, experts argue. "The market is pricing out a Fed hike in October," says Tony Bedikian, managing director of global markets at Citizens Bank. "This [jobs] number is a body blow to the economic bulls out there." 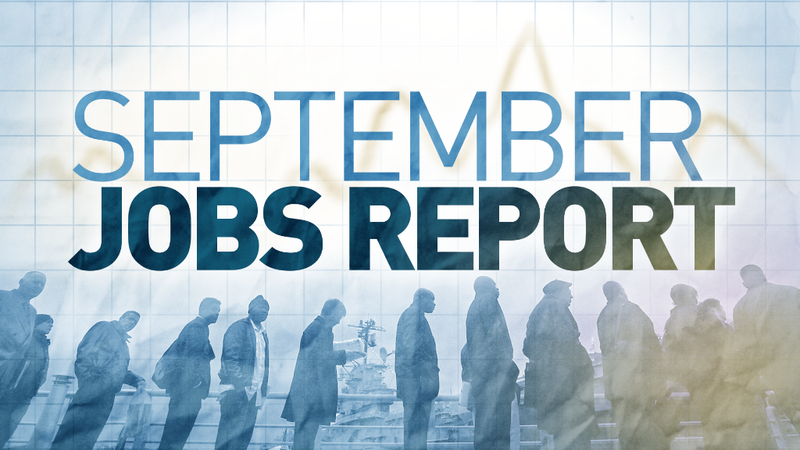 Overall, the September jobs report raises questions about the U.S. economy's momentum heading into the end of the year.